The original Robocop, released in 1987 and directed by Paul Verhoeven, was not only one of the best science fiction films of the last three decades—"a brilliant comedy operating in the guise of an ultraviolent action movie," as Tom Scocca described it on Gawker—it was also a Christian allegory. At least according to Paul Verhoeven himself who, in a 2010 interview, referred to his resurrected robot hero as "the American Jesus." As Verhoeven specifically suggested at the time to MTV, "The point of Robocop, of course, is it is a Christ story. It is about a guy that gets crucified after 50 minutes, then is resurrected in the next 50 minutes and then is like the super-cop of the world, but is also a Jesus figure as he walks over water at the end." For my own part, I'm interested less in validating Verhoeven's perspective than I am in simply discussing how it might be possible to see this cop-returned-from-the-dead as a kind of allegorical machine-messiah. Robocop, the character, would thus be a betrayed figure whose flickering consciousness is pulled back from the darkness of its digital tomb by scientist-disciples who, albeit cautiously, believe very much that he will come back to save them. Comparisons have been made, for example, between Christ being nailed through the palm to a cross and the initial shooting of Sgt. Murphy in the film, whose open hand is targeted with a shotgun. Or, as The Playlist posted just yesterday afternoon, "Verhoeven, on the Blu-ray, also assumes that when Christ returned, he was something of a 'Che Guevara figure,' and would have probably instructed his followers to take up arms, just like Robocop." Just like Robocop—the confidence is both amusing and admirable, but do these comparisons really hold up? At worst, this sounds like something you might cook up after a long night of bong hits—a resurrected man! a quest for justice! a confrontation with those who betrayed him!—and a re-viewing of Robocop with this in mind quickly becomes a futile game of spot-the-Christ-references. However, perhaps speaking only for myself, that doesn't take away from the most basic premise here, which is that we could view Robocop as Verhoeven's response to a kind of mythological or narrative challenge: retell the life, death, and resurrection of Christ (as an historical figure or a religious one, it's up to you) in a way that's relevant for our contemporary context. The idea that someone like Verhoeven might respond to that challenge by inventing a murdered cop who is brought back to life by technical wizardry, only to walk the Earth again as a robot, is pure genius, almost hilariously so. It not only suggests an awesomely freewheeling response to an ancient storyline; it also raises the absolutely gonzo interpretive possibility that the machines and devices around us, from police drones to television sets, are able to bear religious, mythic, or theological implications. It's like the Japanese notion of Tsukumogami—that is, self-aware material objects that manage to wake up, possessed by an intelligent spirit—unexpectedly cross-wired into the Judeo-Christian tradition. These seemingly laughable Christ comparisons are backed up in an interesting fashion by the fact that Verhoeven has actually written his own biography of Jesus Christ. Published in English translation back in 2010 by Seven Stories Press and called simply Jesus of Nazareth, the book was interesting to read for how it might reveal that Verhoeven's experience directing Robocop had retroactively colored his understanding of the life of Christ. In other words, does the book indicate that Verhoeven was actually projecting onto Christ the moral lessons he tried to impart with Robocop? Do Verhoeven's descriptions of Jesus inadvertently reveal that he is actually describing Sgt. Murphy? The story Verhoeven tells—thoroughly scrubbed not only of miracles but also of the very idea of resurrection, in order to depict Christ as just another human being—does include one interesting detail. Discussing some of the uncharacteristically mundane things Christ is meant to have said upon his return to the world of the living, Verhoeven remains—to use a weighted word—doubtful. "Where is the sharpness of his words," he asks, "the brilliance of his observations, the humor of his hyperboles? Is this the man who created those magnificent parables, the man who introduced a radically new code of ethics? 'Peace be with you.' 'Have you anything here to eat?' 'Do not touch me.' These sound more like an automaton than a living person." He is more like an automaton, Verhoeven suggests. He is stilted, stoic—robotic. In any case, Verhoeven's book ends with a few appendices, one of which discusses the so-called "secret gospel" of Mark, a kind of deleted scene from the mythology of Christ's life and return, and now part of the apocrypha of the Christian tradition. 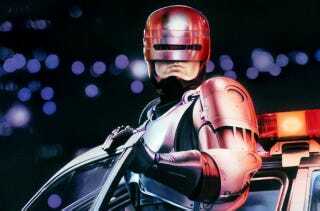 This inclusion of extra-biblical resources raises the interesting possibility—one that is narratively questionable and even somewhat insane, sure, but still worth entertaining—that the original Robocop should, in fact, be considered an example of 20th-century apocrypha, part of the unofficial interpretive tradition that Verhoeven ends his book discussing. If we can allow ourselves to watch it this way, Robocop becomes a mechanical allegory of justice and resurrection, a film that reveals the strange science fiction at the heart of one of the world's largest religions.